Sindh government has introduced security featured Motor Vehicle Registration (MVR) smart card for vehicle registration to ensure authentic registration of vehicles. 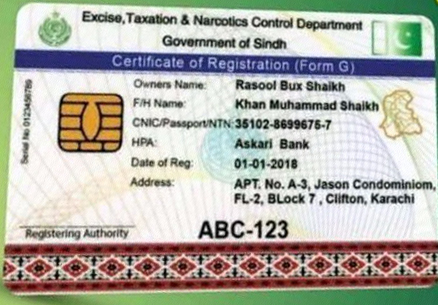 On 14 May, Sindh Minister for Excise and Taxation Mukesh Kumar Chawla introduced the smart cards to eliminate forgery in transfer and registration of vehicles. Talking to the media after introducing the smart card at Civic Centre in Karachi, Chawla said this is a milestone achieved by the Sindh Government and such steps will not only eradicate the menace of fake registration of vehicles that was a real threat to law and order situation but also facilitate the citizens. With the help of smart cards, the vehicles could be verified anywhere across the province through special devices. These smart cards are equipped with some advanced security features as compared to traditional registration books. Back in August 2016, Chawla announced that his department would convert license books into smart cards to eliminate the threat of fake registration and to allow greater flexibility to the authorities as well. A similar initiative has also been launched by Punjab Government. 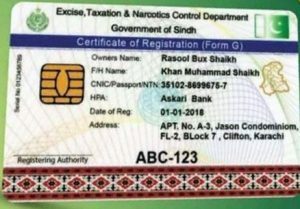 Sindh Home Minister Syed Murad Ali Shah appreciated the step of introducing the smart card for verification of the vehicles and asked the excise department to introduce such measures for motorcycles registration as well as a large number of street crimes were committed by the bikers. The minister for population welfare Mumtaz Khan Jhakharni also acknowledged the efforts of Chawla and his team, saying that the provincial government had taken many measures to provide relief to the people and the introduction of smart Card is among one of them.